Yet one more piece of evidence tying the United States to the Islamic State recently came to light. In a new video interview, Sheikh Yusuf al-Qaradawi, one of the most authoritative clerics in the Muslim community who has his own program on Al Jazeera and is chairman of the International Union of Muslim Scholars, asserted that the leader of the head-chopping, infidel-crucifying Islamic State, Abu Bakr al-Baghdadi, was once a member of the Brotherhood, which the U.S. government, especially the Obama administration, has been allied with. Indicators of a U.S./Brotherhood alliance are too many to list here and have been on open display from people like Hillary Clinton, former U.S. ambassador to Egypt Anne Patterson, and Sen. John McCain (who may have taken pictures not only with known Islamic terrorists, but with al-Baghdadi himself). According to Sheikh Qaradawi, "this youth [al-Baghdadi] was from the start among the top ranks of the Brotherhood, but he was inclined to [positions of] leadership and so forth... Then, after he spent years in prison [for Brotherhood activities] he came out and joined with them [nascent Islamic State]," eventually rising to be its "caliph." 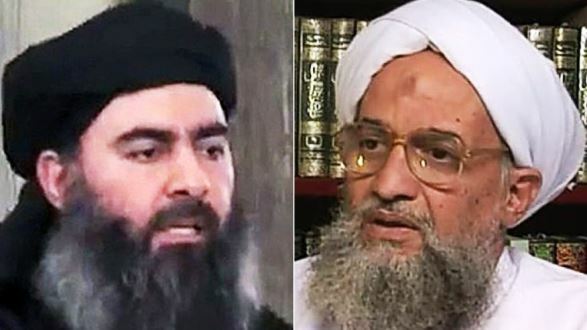 Egyptian Minister of Religious Endowments (Awqaf), Dr. Muhammad Mukhtar Gom'a said that "Qaradawi's confession [concerning al-Baghdadi] confirms that the Brotherhood is the spiritual father to every extremist group." Even so, Qaradawi's revelation was not meant to cast aspersions on the Brotherhood, especially as he is one of its spiritual fathers. More likely he was invoking the idea that imprisoning and suppressing "moderate Islamists," namely the Muslim Brotherhood—most recently in Egypt's last revolution—only leads to their "radicalization" and turn to violence. This is a widely accepted meme, especially in the West. Al-Qaeda's Ayman Zawahiri is another former Brotherhood member who is regularly portrayed as turning to "radicalism" and jihad after being imprisoned in Egypt in 1981—though any evaluation of the facts of his life demonstrate that he was a "radical" well before he was incarcerated, that he was imprisoned precisely because he was radical. The idea that it is best to cooperate and ally with the "moderate" and "nonviolent" Muslim Brotherhood lest, aggrieved, it turns to "extremism, radicalism, and terrorism" has been swallowed by many Western academics and politicians hook line and sinker. To understand this phenomenon, one need only turn to the "good cop, bad cop" routine and see how it captures U.S. behavior towards "moderate/nonviolent Islamists" ("good cops") on the one hand, and "radical/violent Islamists" ("bad cops") on the other. Good cop/bad cop, also called joint questioning and friend and foe, is a psychological tactic used for interrogation. "Good cop/bad cop" tactics involves a team of two interrogators who take apparently opposing approaches to the subject. The interrogators may interview the subject alternately or may confront the subject at the same time. The "bad cop" takes an aggressive, negative stance toward the subject, making blatant accusations, derogatory comments, threats, and in general creating antipathy between the subject and himself. This sets the stage for the "good cop" to act sympathetically, appearing supportive, understanding, in general showing sympathy for the subject. The good cop will also defend the subject from the bad cop. The subject may feel he can cooperate with the good cop out of trust or fear of the bad cop. He may then seek protection by and trust the good cop and provide the information the interrogators are seeking. Consider how this definition applies to the U.S. government's approach to the supposed Islamist dichotomy of "violence" and "nonviolence." The violent jihad—whether under the rubric of "al-Qaeda," "Islamic State," etc.—like the "bad cop" "takes an aggressive, negative stance towards the subject [U.S./"infidels"], making blatant accusations, derogatory comments, threats, and in general creating antipathy between the subject and himself." Thus the violent jihadis become the "feared enemies" who cannot be reasoned with. appearing supportive, understanding, in general showing sympathy for the subject. The good cop ["moderate" Brotherhood] will also defend the subject [U.S. interests] from the bad cop [Islamic jihadis]. The subject [U.S.] may feel he can cooperate with the good cop ["moderates"] out of trust, or fear of the bad cop [terrorists]. This in fact is the idea long spearheaded by Mideast academics and talking heads—that there are "nonviolent" Islamists and "violent" Islamists, and that the best way to weaken the appeal of the latter is to cooperate with the former, which, after all, shouldn't be too hard, since the "good cop moderates" come in suits, smile, and shake hands over cups of coffee. For instance, CDR Youssef Aboul-Enein, an Obama advisor, argues in his book, Militant Islamist Ideology: Understanding the Global Threat, published by the Naval Institute Press (2010), that "It is the Militant Islamists who are our adversary. They represent an immediate threat to the national security of the United States. They must not be confused with Islamists." Aboul-Enein, like many before and after him, argues that U.S. leadership should work with the nonviolent Islamists in order to weaken the appeal of the militants. And yet, just as the "good cop/bad cop" is a false dichotomy in that both "cops" are working together and for the same goal, so too is the "nonviolent Islamist/violent Islamist" a false dichotomy in that both Islamists are working together and for the same goal—the resurrection of a Sharia-enforcing caliphate, which the Islamic State ("violent Islamist"), led by Abu Bakr al-Baghdadi, a former Muslim Brotherhood member ("nonviolent Islamist"), recently accomplished.